Cathay Pacific is blaming too many empty seats and increasing competition from Mainland China for only its third annual loss in company history. In 2015, Cathay Pacific reported a HK$6bn annual profit ($772mn USD). In 2016, the company lost $575mn ($74mn USD). Why the huge reversal? 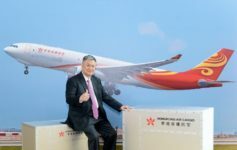 The same market dynamics that are pressuring carriers in North American and Europe plus the added fortune of a burgeoning Mainland China aviation industry. To be sure, the Gulf Carriers are putting a squeeze on Cathay Pacific. Connecting in Dubai or Doha saves time over connecting in Hong Kong if traveling between Europe and Australia. Those were bread and butter routes for Cathay in the past. But China’s rapid aviation expansion represents perhaps an even greater threat to Cathay Pacific’s sustainability. Chinese carriers are expanding their international reach, offering more direct flights to global cities than ever before. That means passengers do not have to connect in Hong Kong, as in the past. There goes more bread and butter routes. And it will only get worse. Chinese carriers are modernizing their fleets with fuel efficient 787s and other aircraft perfectly suited for direct longhaul routes that were otherwise unfeasible. A320NEO and 737MAX planes are coming, opening up more midhaul routes in Asia. With more connections to the Mainland from Taipei now, Hong Kong is no longer a necessary intermediary. Cathay Pacific has a lot to be worried about. Cathay Pacific points specifically to “intense competition” Air China (Star Alliance) and China Eastern (SkyTeam). Demand for premium cabins is down and passenger yield (average fare paid per mile per customer) is down 9.2%. Even Cathay’s cargo business is suffering. Some of the loss is allegedly due to fuel hedging. Were that the case, though, I think Cathay would be quite comfortable citing that instead of more systemic issues as the reason. Yesterday I wrote about Finnair’s growing dissatisfaction with oneworld‘s presence in Asia. A closer partnership with Finnair, however, might further strain Cathay Pacific’s objective of winning more passengers, particularly price insensitive premium cabin business travelers. Sadly for Cathay Pacific, the problem is not (necessarily) having the wrong partners, but the risk of redundancy thanks to new direct routes on Mainland carriers. There are 2 things wrong with this right here. First, if you plot LHR-SYD, HKG is nearly perfectly along the great circle routing. You only save time in the Middle East if you’re traveling from the smaller destinations that CX cannot support a nonstop. Second, CX has never been a huge player on the “Kangaroo Route”. SQ was the one dominating the Kangaroo until the ME3 arrived. HKG has restricted bilaterals with Australia, so chasing Europe-Aussie traffic is a sure way to waste valuable seats for CX. CX serves AKL,SYD,MEL,CHC,PER,BNE, and ADL. How is that limited traffic? Or are you saying that they cannot sell thru-flights to Europe. I think you’ve got this story exactly backwards thanks to poor press reports about CX earnings, and it is a source of continuing fascination to me that reporters in the financial press don’t know how to read an earnings report. Cathay’s loss has little to do with competition — that is the spin that Cathay’s management is trying to sugarcoat this with. In fact, CX had another huge operational profit this year. Cathay’s earnings results includes a loss of HK$8.46bn on “hedging” the price of jet fuel — that is, wrong bets that the price of jet fuel would rise. Add this self-inflicted wound back into the report, and you can see that CX’s airline is quite a profitable enterprise, and continues to be so despite competition, etc. The even more shocking thing is that this is the second year in a row that CX has had a loss of this order of magnitude (over US$1 Billion!!) in a row. You seem to think that CX management would prefer if the loss were caused by operations instead of hedging, but you also have this precisely backwards. Of course, CX management would love to blame competition, and things out of its control for the loss, instead of the reality that management is actually directly responsible for the very foolish choices behind this massive loss. The real story is that management has been running a commodities hedge fund, instead of running an airline, and have lost vast amounts of their shareholders money in doing so. The scandal is even more acute given that CX shareholders own a minority interest in the airlines, and that management has little or no accountability to them. You should correct the story so as not to promulgate CX management propaganda, as the rest of the media seem to be doing for them. Hong Kong has been a financial hub back in the days when HKG was a British colony. I’d think the nonstop flights (especially in premium cabins) on CX to/from Hong Kong would give CX the edge. It’s unfortunate Cathay Pacific had a loss. I hope they bounce back. Cathay’s biggest problem is that they’re a global Asian carrier not massively subsidized by their government. I have to laugh at the naivete of so many bloggers who seem to believe that the Middle East carriers have such a great business model that they can magically make money even though they face competition about 4x as bad as Cathay’s. This is a hard business without billions in subsidies. And it’s even harder when some of your competitors are getting them. Samir, who is arguing against the reality of subsidies? Of course the ME3 are subsidized in various indirect ways. That is part of the government’s plan for economic growth. Still far better than United dumping its pension system on PBGC then crying wolf over Emirates.